BARRINGTON, Ill. (WLS) -- In an effort to combat a growing outbreak of mumps centered around northwest suburban Barrington, Lake County health officials are setting up a vaccination clinic for faculty and staff of the hardest-hit school. As of Thursday, the Lake County Health Department is reporting four confirmed cases of mumps and another 35 probable or suspected cases in the county, with Barrington High School reporting the highest number. There were three confirmed cases, seven probable cases and 12 suspected cases at the high school, while Station and Prairie middle schools in Barrington had one probable and nine suspected cases, up three from Wednesday, according to the health department. In response, School District 220 is working with the health department and taking extra precautions as far as cleaning and sanitizing, according to a statement on its website. "Barrington 220 facilities are always cleaned thoroughly each night," the statement said. "Due to the presence of mumps in the community, extra custodians are being brought in as needed. As directed by the CDC, custodians will clean all high-touch surfaces like doorknobs, tables, chairs and bathrooms with a bleach-based solution." The district has also instructed the Barrington Transportation Company to clean its school buses "with the same protocols being implemented in our facilities." There is one other confirmed case in Barrington, though it was not believed to be related to the school. There is also a suspected case at Libertyville High School; a probable case in Lake Zurich related to a confirmed case in Barrington; and suspected cases in Lake Forest and Tower Lakes, the health department reports. Barrington High, the health department and District 220 will conduct a mumps clinic early next week for staff, faculty and students who are not current with vaccinations. 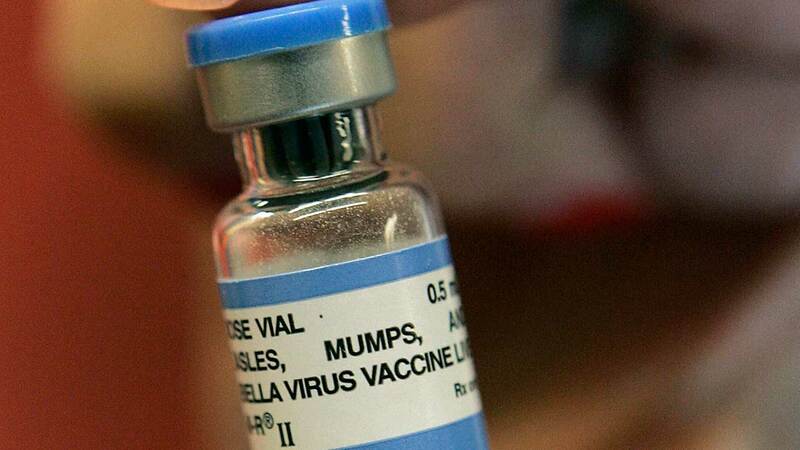 A second dose of the measles, mumps, rubella (MMR) vaccine will be administered to those who have had only one, and single doses will be administered to people born before 1957. The clinic is open only to those affiliated with the school. Presently, there are no plans to close school due to the virus, the school district said in a statement. "Barrington 220 is taking direction from the Lake County Health Department and Illinois Department of Public Health regarding this issue, and will keep the community updated on any new developments." The health department recommends vaccination as the best way to protect yourself . "The vaccine against mumps is extremely effective and usually produces long lasting immunity," Mark Pfister, executive director of the health department, said in a statement. "While no vaccine is 100 percent effective, it is important for those who can be vaccinated to take this extra step and help protect those around them." Mumps is a contagious disease passed through saliva and respiratory secretions, the department said. It is spread by "droplets of saliva or mucus from the mouth, nose or throat of an infected person, usually when the person coughs, sneezes or talks." Most people with the virus show only mild or no symptoms, and nearly half who get mumps exhibit very mild or no symptoms, according to the health department. Common symptoms include fever, headache, muscle aches, tiredness, loss of appetite, swollen and tender salivary glands under the ears on one or both sides. Those who get mumps are considered contagious two days before until five days after swelling, and are advised to stay home and contact a doctor. Frequent hand washing, minimizing contact with others when sick, sanitizing frequently touched surfaces, and not sharing eating utensils, drinking cups, or cigarettes are among the other recommendations for slowing the spread of the virus, the department said. Cook County health authorities also report a possible case of mumps at an Andersonville neighborhood elementary school on the North Side. Chicago Public Schools notified parents on Monday about a case of mumps at Pierce School of International Studies, but it has not been confirmed.